Ok let’s just say today wasn’t the winningest day I’ve ever had. The theme for my day would be, “two steps forward, three steps back”. Or is it,”three steps forward, two back”? You know what I mean. Things that were done got undone. Technology was not my friend today. I went to go pick-up dry cleaning that I never dropped off. True story. Anyway – not my day. It was time for chocolate cake and tv. But because this is opposite of good day – I didn’t even get this right. The cake looks good in that pic, because I FaceTuned it. What is that you ask? New favorite app. Spend the $3.99. Treat yo self. As I was saying, the cake looks good but it was just ok. Not that I expected anything else from it. It’s a boxed, aisle cake. I wish it no ill will. It was a sad attempt at saving my day. And the tv… I know I know. I should have known better. Even with my low-brow tv habits I haven’t succumbed to The Bachelor (ok I watched season 1-3 but those weren’t bad). But there’s been so much chatter about it that I gave in. It was a weak night. Oh god was it bad. Like so bad I am shook people aren’t talking about how bad it is. The premise is interesting. He’s a virgin. There’s a house full of vipers after him. It could be so bad it’s good, but it’s so bad that it’s sad. Weird and uncomfortable. Perfect for my day. I’m just going to bed. We can try this all again tomorrow. Not that I’m comparing myself to the caped wonder. I’m not super at all. And I would never wear blue tights. My husband used to work in a bakery all throughout high school. He worked for a wonderful baker whose family has owned a German bakery in NYC for over a 100 years (it’s still there – everyone check out Glaser’s on the Upper East Side!). That lovely baker is my daughter’s godfather and one of our closest friends. In college he let me work at the bakery to make some extra money. Early in our marriage we lived in an apartement right above that bakery, and I’ve never met anyone who likes cake more than me! So why for the love of all the sugar gods can’t I bake? And please, save me all your advice. Yes, I know baking is a science. I know I can’t “wing” ingredients. Oh, you bake all the time do you? It’s easier than cooking you say? Well in the words of Christian Bale when he had the meltdown on camera…”GOOD FOR YOU!”. Bake yourself a cookie and eat it why don’t you. Sorry. I’m just covered in sugar and failure. I’ll be nicer tomorrow. Here’s my latest crumby attempt. Literally. No, this isn’t the crumb layer. This is the final product. Oh I’ll still eat it. I’m not nuts. But I am done with baking for good! Done I tell you! Done! My favorite part of my favorite movie was on exactly when I needed it. Today was about baking. And burning. And not thinking I didn’t needed parchment paper and then needing parchment paper. It was about being pissed off because my mother buys me a roll of parchment paper every time I see her. And toilet paper and ziploc bags. So even though I had 10 rolls of parchment paper I didn’t use it. And the coconut macaroons paid. They paid dearly. 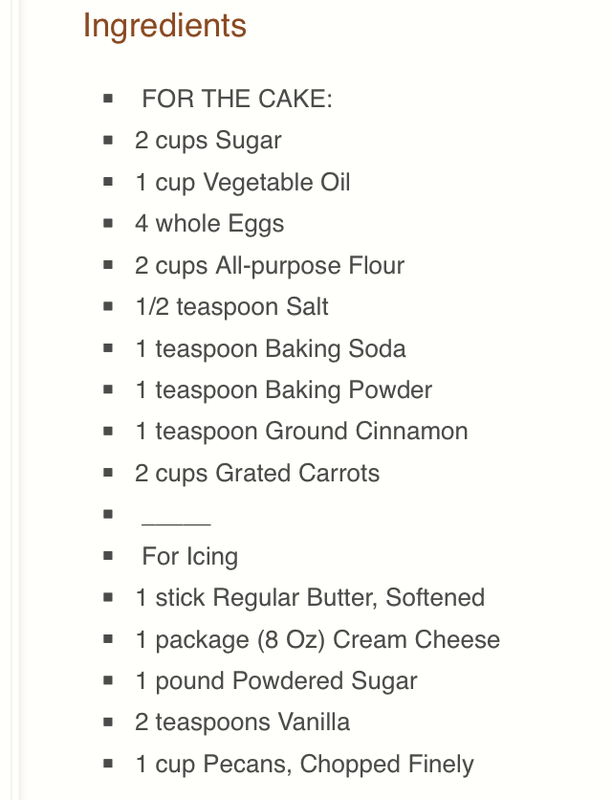 There was also an episode involving using light brown sugar instead of dark brown. Can’t things be easier?? 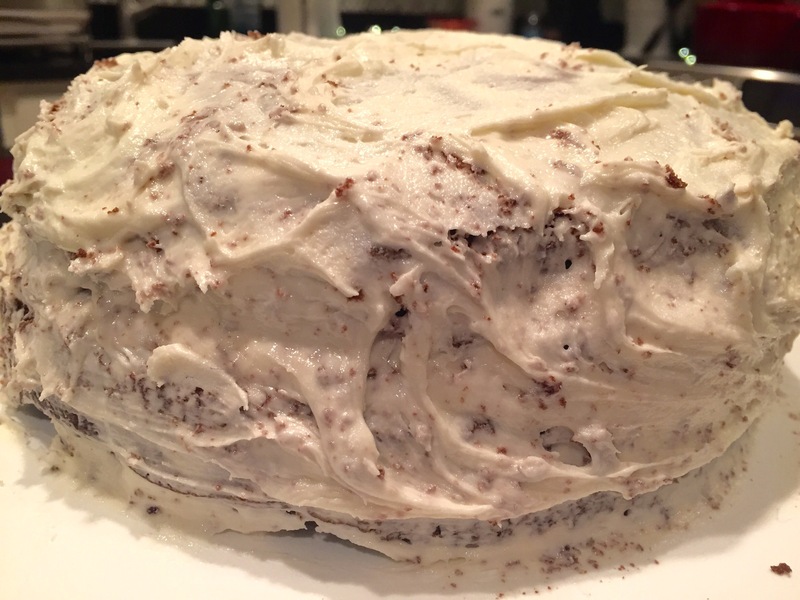 Suffice it to say – I spent the whole day acting like I’ve never baked. Then I remembered that I actually haven’t baked since his time last year. But that’s not an excuse. All I had to do was follow directions. And the directions said use f@@king parchment paper. So after that day I took a bath. Took an Advil. And turned the TV on. And instantly I’m in a good mood again. I’m easy. Easy like parchment paper. It’s December 1st. Tradition says that if you say those words together today you’ll have some good luck or good vibes or good something. Don’t we all need some good vibes? How are you? You doin’ ok? Made it through Thanksgiving? Me too. It was so much fun. I’m back at work after a whole week off. Actually I was back at work yesterday but it didn’t feel real yet. I was still avoiding all the work by asking people about their turkeys. It was awkward. People would come into my office to talk about some upcoming event and I’d redirect, deflect and evade. “Can we go over this event agenda…” they’d say trying to keep me ontrack. “Agenda…hmmm….yeah. What was your agenda for dessert on Thanksgiving? Let’s talk about that first.” I’d fire back. I was hopeless. By 1pm I was finally ready to give it up. No one seemed to be having the post tramatic turkey day withdrawal like me. So what’s next baby? Christmas? Hanukkah? New Year’s? I like the holidays, what can I say? I like seeing friends and family. I like baking cookies. I like buying gifts. I like the whole damn thing. One day, when my kids don’t see me everyday and my husband has lost most of his sight, I’ll be one of those people that not only decorates their home, but also themselves. That’s right. I’m talking themed clothing people! Christmas sweaters. Thanksgiving earrings. Halloween PJs. Oh it’ll be on. Till then – here’s some random photos to enjoy. 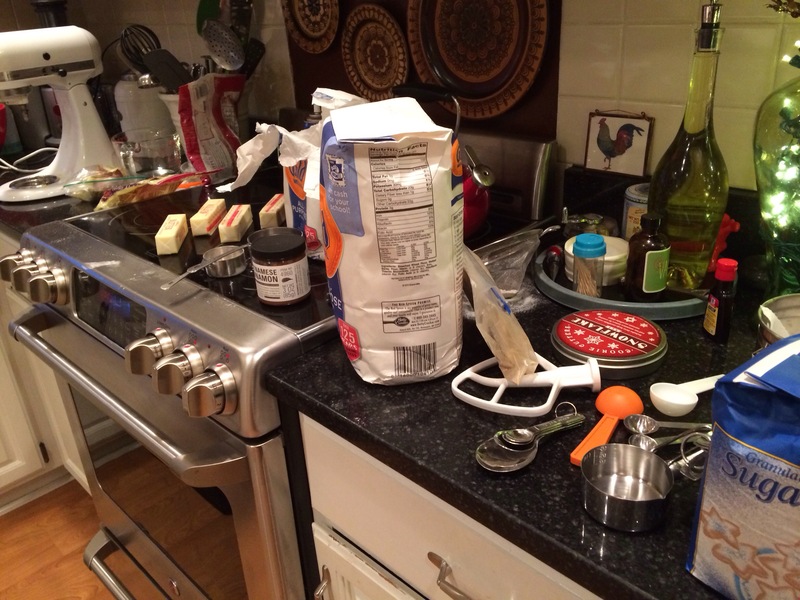 My kitchen as I prepped. My turkey (apparently claried butter is the way to go). A couple of people passed out on the couch after dinner – which I consider the ultimate compliment. Photos of the hike my sister orgnaized for a few of us. I think more people would have joined had they known we would be stopping at a Vineyard on the way home. True story. 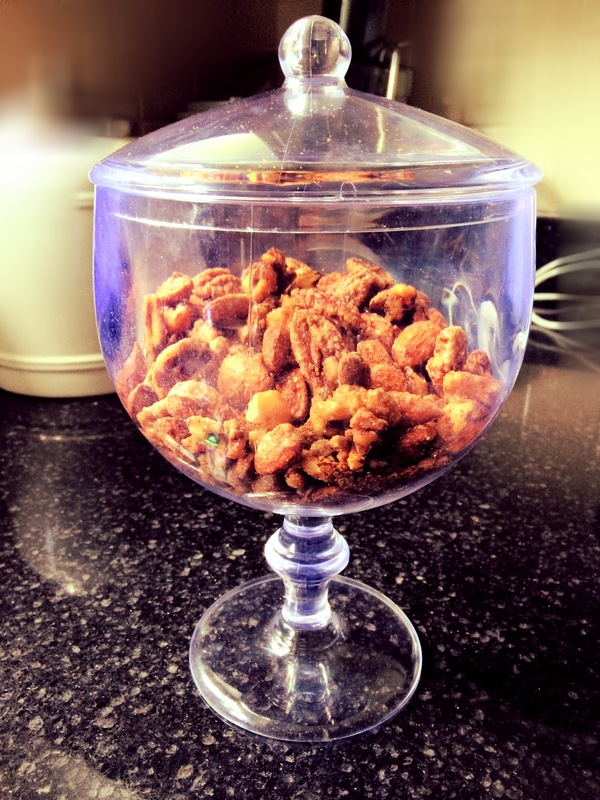 Two years ago my sister showed up at Mother’s Day or Thanksgiving or Christmas – one of them – with a bag full of these spicy, sweet, salty nuts. They have a strange crack-like power on everyone who tries them. I decided to make a batch for our favorite aunt out in Long Island who takes our girl for a beach adventure every summer. In fact she’ll take any girls – all girls seem to be welcome. Boys too maybe. She’s good like that. She deserves some nuts. 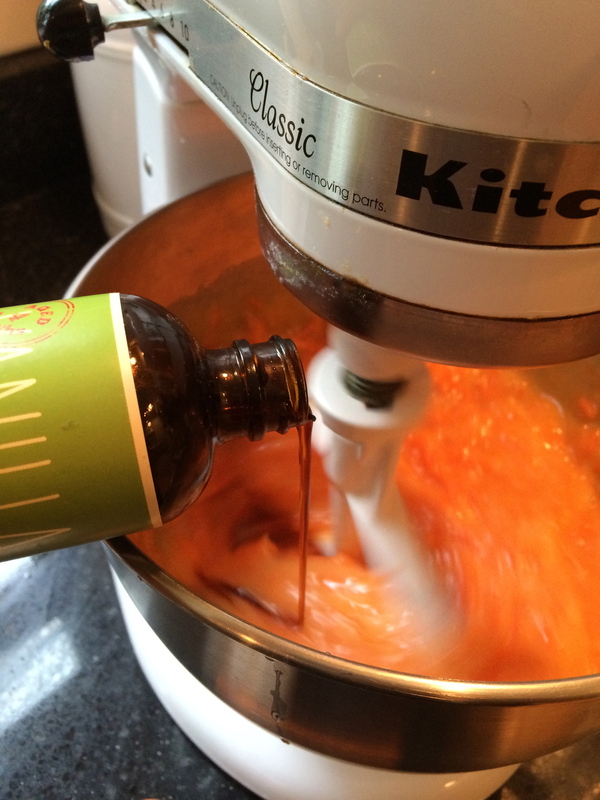 This is the Smitten Kitchen recipe, quadrupled. Cause that’s how I roll. 4 Cups Nuts (any nut will do. 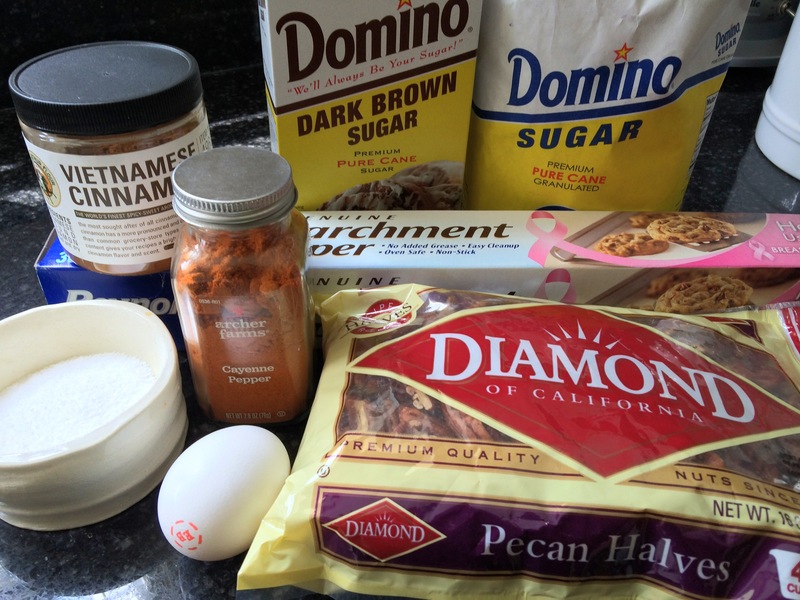 Except the nut you’re married to), 1 egg white, 1/2 Cup Brown Sugar, 1/2 Cup White Sugar, 2 tsp Cinnamon, 2 tsp Salt, 2 tbs Cayenne Pepper, 3 tbs water. Combine the sugars, cayenne pepper, salt and cinnamon. 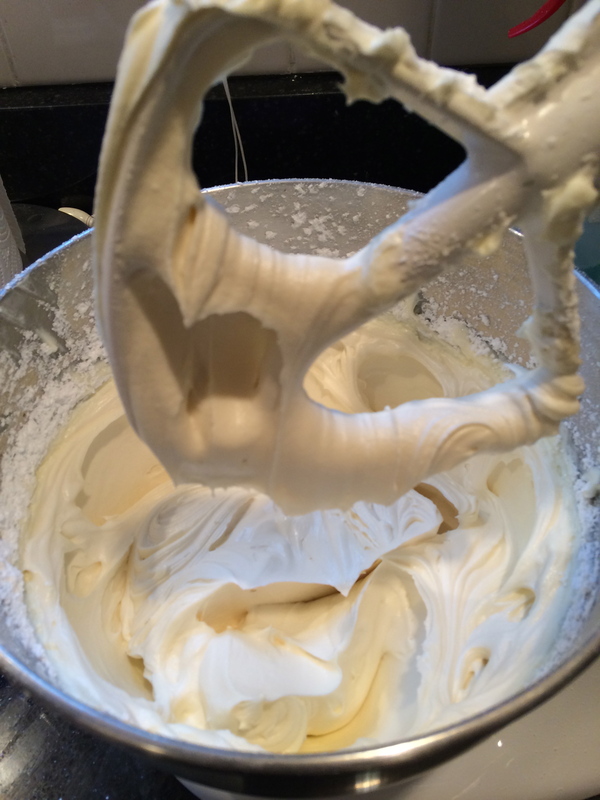 Whisk the egg white with the water until frothy. 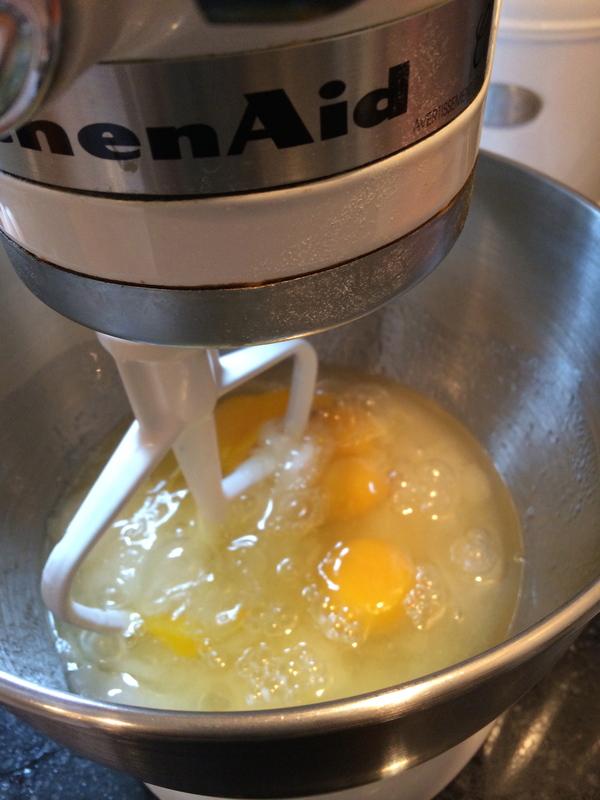 Add egg whites to the nuts and coat evenly. Add the sugar and toss. Spread evenly in one layer on parchment paper and bake at 300 degrees for 30 minutes. Let cool completely before packaging. I made a batch of these last week to take to a picnic and found this cute candy bowl. The plan was to give the host of the picnic the nuts and bowl, but when he offered it back at the end of the night, I took it. I couldn’t help it. It’s so cute. 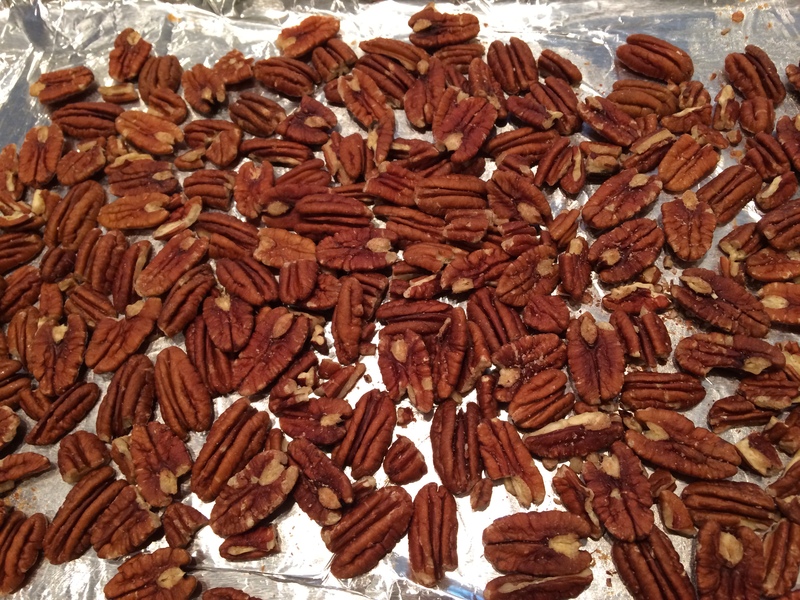 The first batch of nuts I made were pecans, almonds, and walnuts. 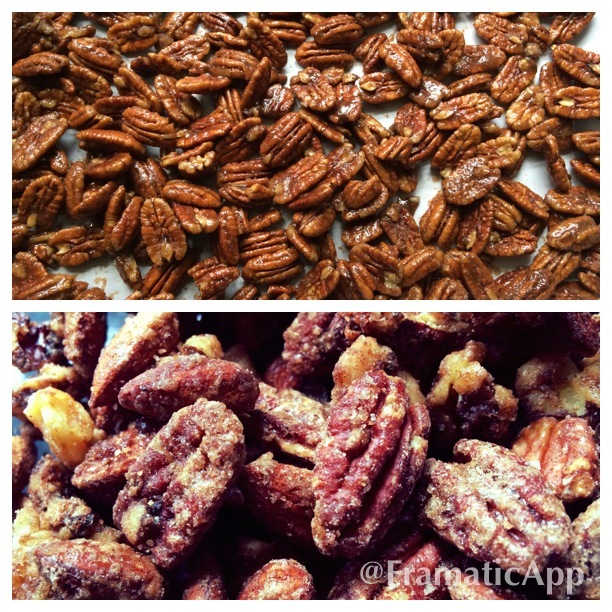 The clear winner taste wise in our house is the pecans – so that’s what I made today. A couple of years ago I was gifted a fantastic cookbook called “Flour”. It is based on a bakery in Boston called Flour Bakery (duh). I love this book. I’ve made many of the recipes. I even went and found the bakery in Boston. Like all pilgrimages, there was a little bit of let-down (what? you aren’t impressed that I have your cookbook and love it? I’m not the first person to come in and want to chat about it?) – but in the end I felt validated. Croissants have a way of validating me. 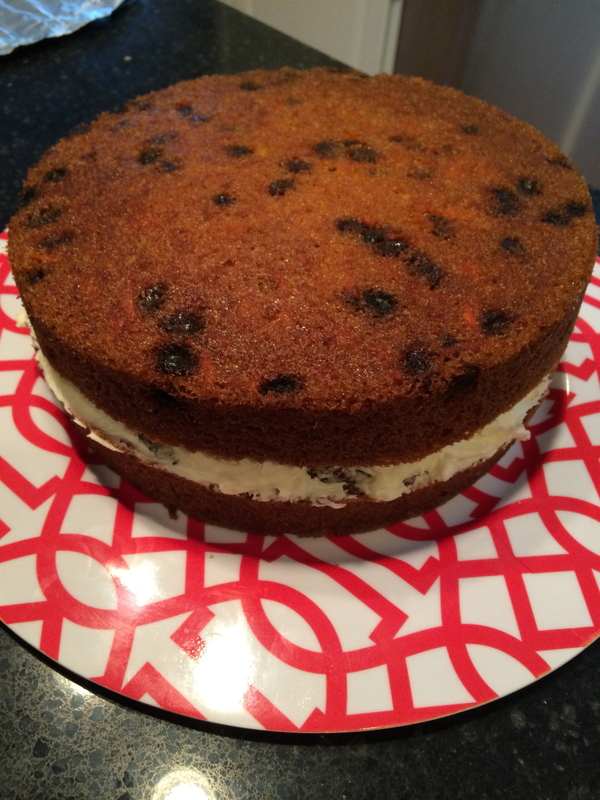 My two go-to recipes are the banana bread and the carrot cake. My two biggest fails from the book are the granola bar cookies and the chocolate almond dacquoise. That’s another story. 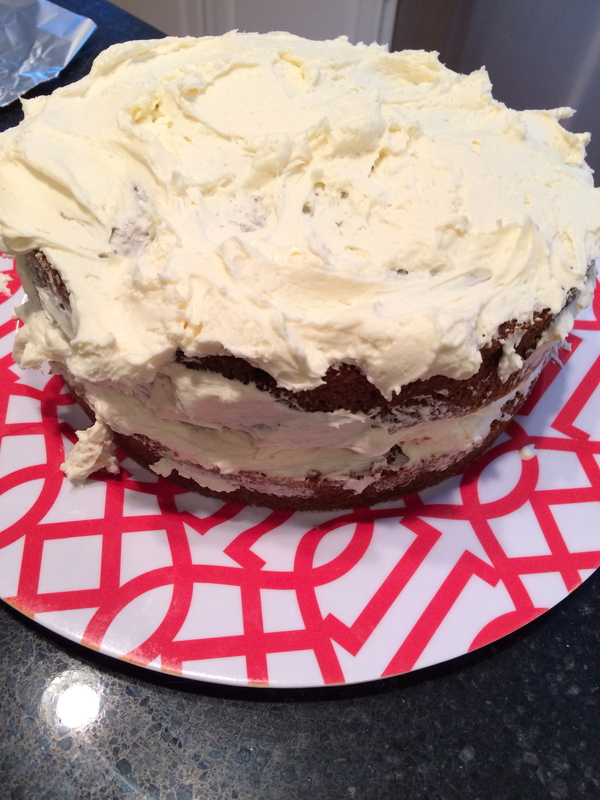 I made the carrot cake this weekend. Try it. People will hug you for it. 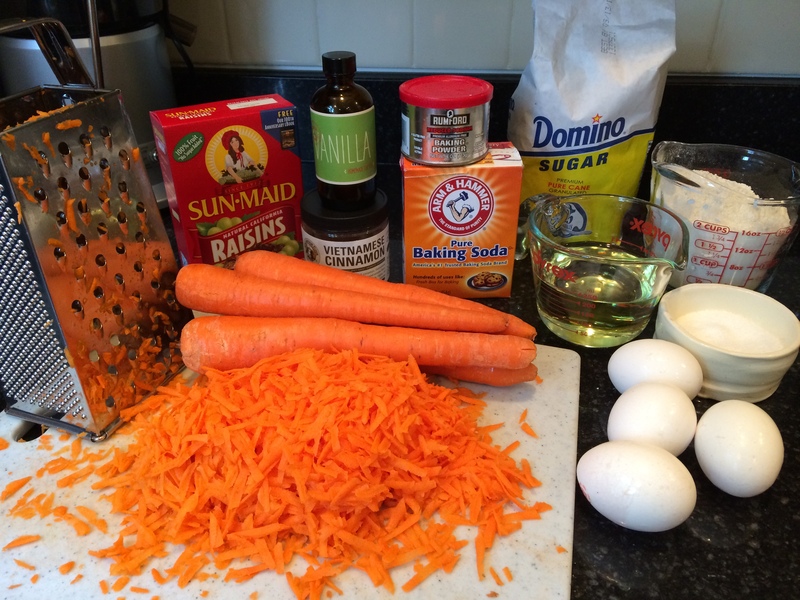 As always – here’s the recipe and the visual. You know I like pictures. Notice I added raisins. My man likes raisins. What can I say. 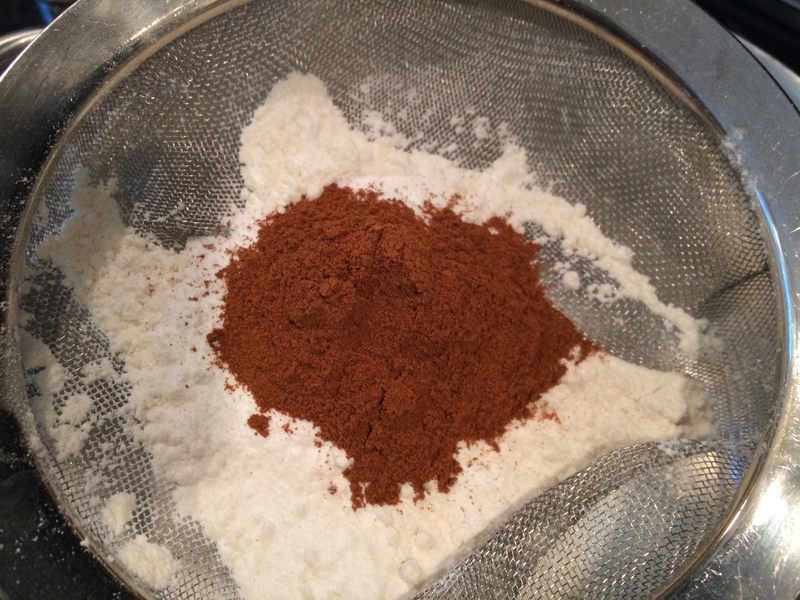 Sift the flour, baking soda and powder, salt and cinnamon. My “sifter” is a strainer that I warped in the dish washer. Just an fyi. 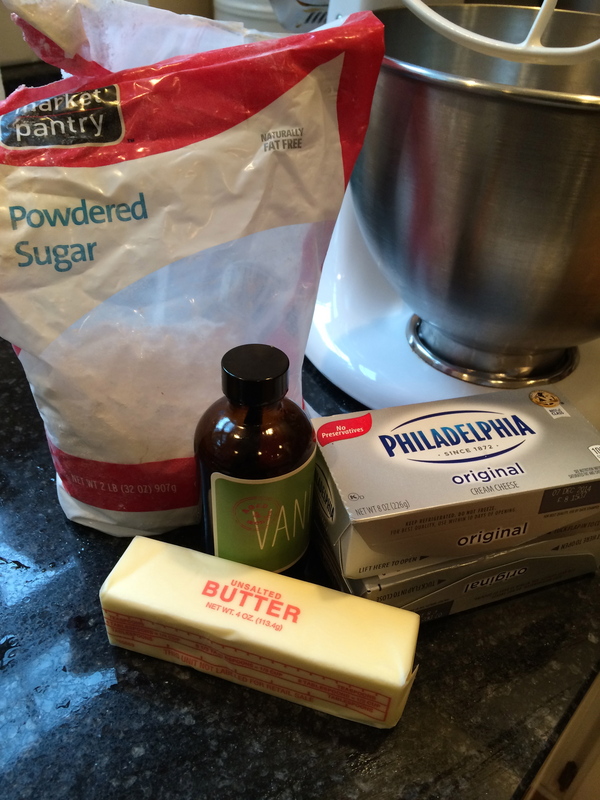 Cream the oil, sugar and eggs. 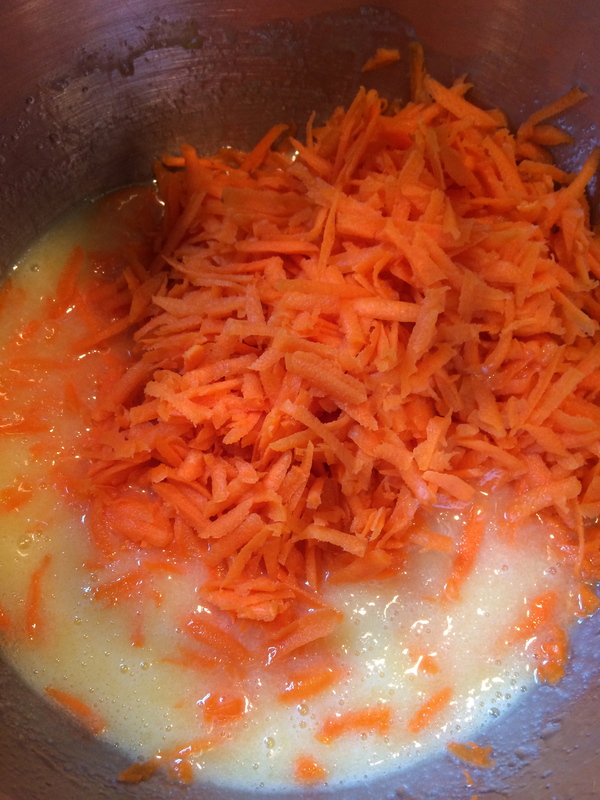 Add your carrots. Please don’t use the pre-shredded ones. They are covered in some sort of nuclear coating so they don’t stick together. 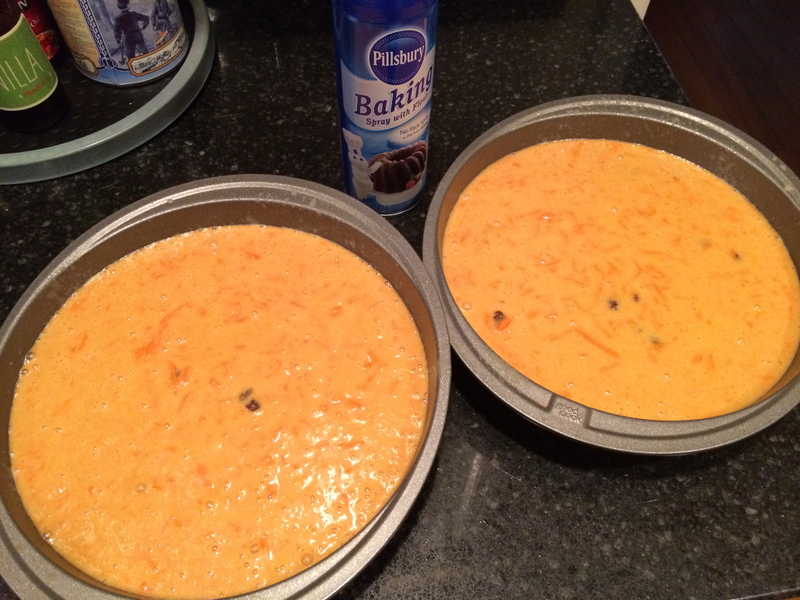 But that coating also make it impossible for them to soften in the cake. So go old school and shred by hand. Add vanilla. This is a homemade bottle my little bitty sister gave me a while ago. I keep adding store bought vanilla and trying to extend the life. Poor me. If only SOMEONE would make me more. Anyhoo. 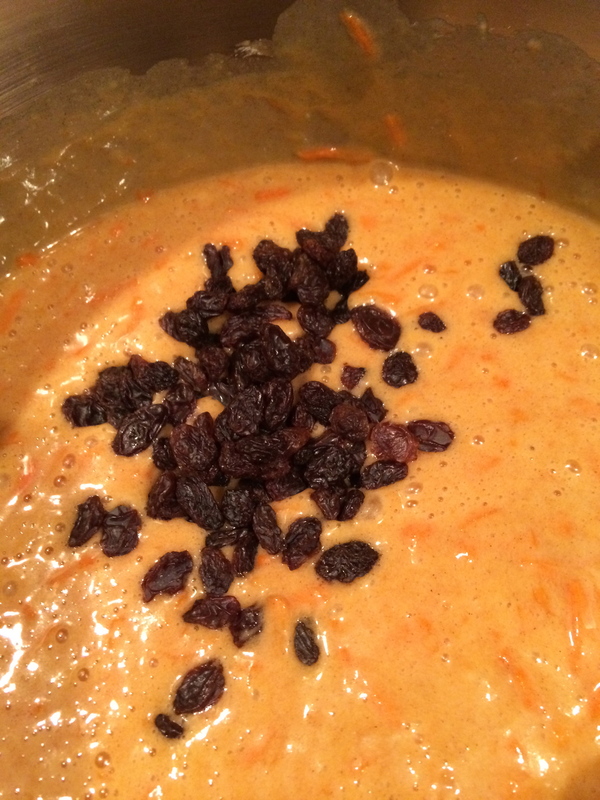 Add raisins if you want to or if you’re maritally committed to. Divide amongst your pans. If you are are suspicious of non-stick pans like I am – add some non-stick spray. Otherwise, be normal and healthy and skip this step. Bake at 350 for 45 minutes . 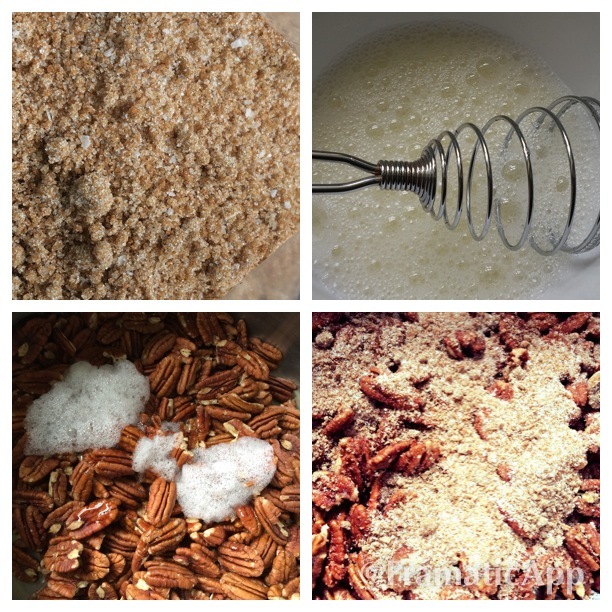 I forgot to add pecans to the ingredients photo. So sorry. These very very important. Toast a cup and let cool. 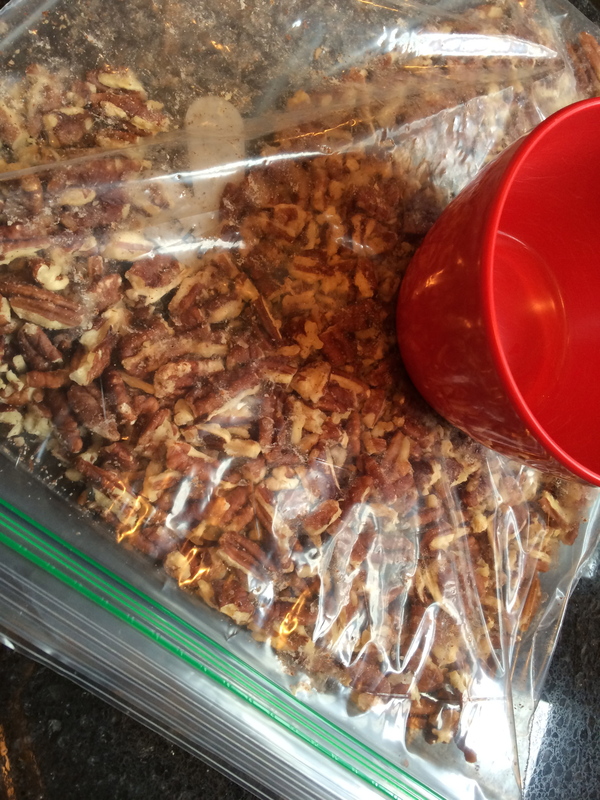 Then using a highly evolved Ziploc bag/bottom of a plastic bowl method – pound them into pieces. 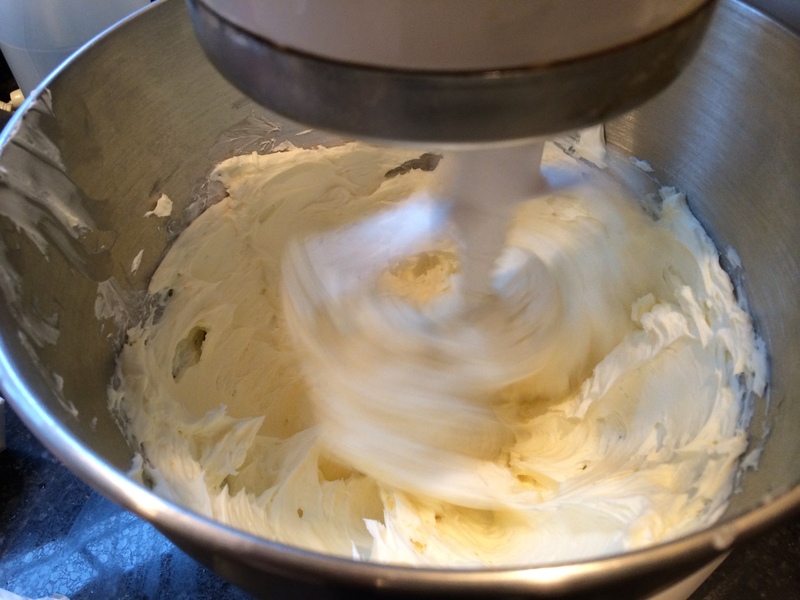 Make the frosting by creaming butter, powdered sugar, vanilla (poor poor me) and cream cheese together in an empty kitchen, better to do multiple tastings. Frost between layers and frost. You only have to make the top look pretty. 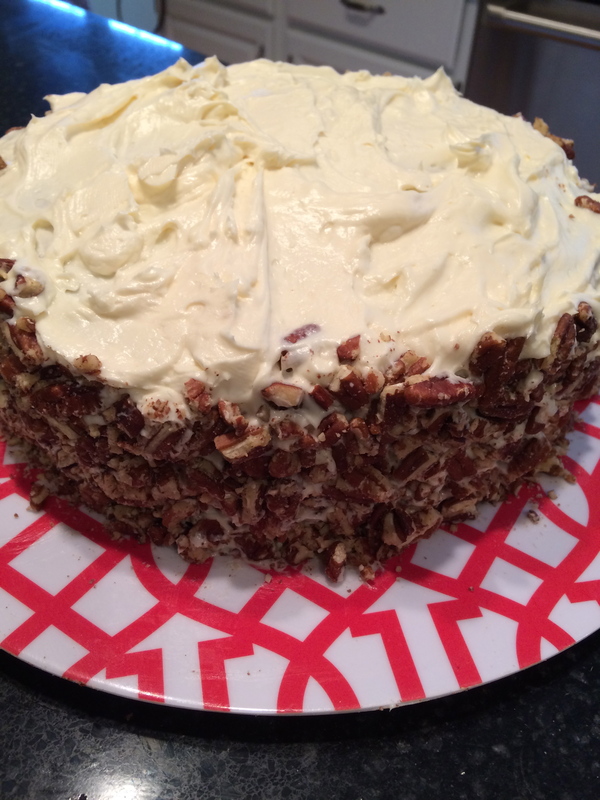 Take the pecans and use them like Spanx all around the cake. They push and tuck all the unruly bits into place. You have a tight, toned and together cake. Refrigerate for an hour before serving and then sit back and accept all the love. 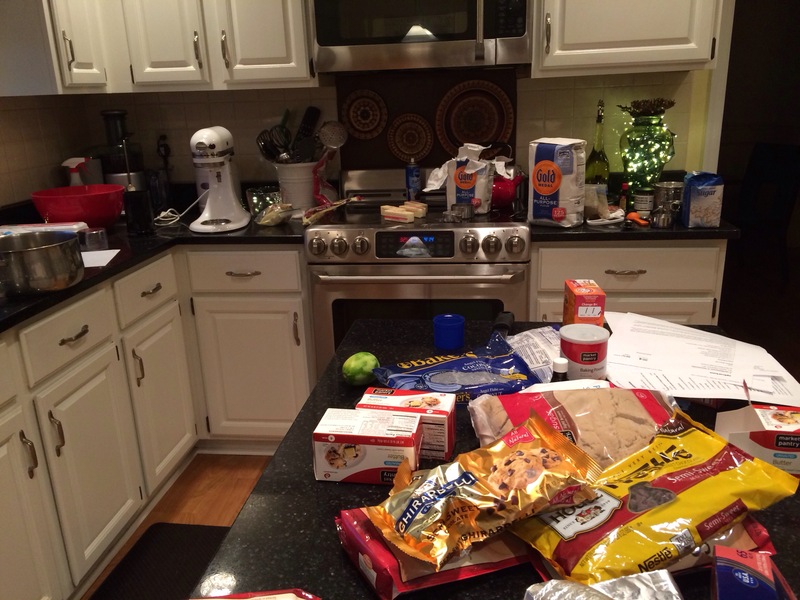 That moment after you lay everything out to make Christmas cookies and you think to yourself… I coulda been watching a cheesy holiday movie. Sigh.